From classic updos to flowing tendrils to casual looks, there are many different bridesmaid hairstyles that can be perfect for any type of wedding. The traditional “I do updo” is one of the most popular styles for brides and bridesmaids alike, though a bridesmaid would typically not wear a headpiece or very elaborate accessories if she has this type of formal hairstyle. Long, loose curls can be perfect for a bridesmaid. Curls, such as those you can get with a spiral perm, evoke thoughts of innocence and romance that are perfect for a wedding day. Bridesmaids with naturally curly hair can do this style easily, though it will take more work for bridesmaids with straight hair. Adding flowers to a simple updo or bun instantly dresses up the look for a bridesmaid style. Colorful blooms that match the wedding bouquet or bridal party dresses are the most popular options and can add easy glamour to simple bridesmaid hairstyles. There are many types of braid styles that can be perfect for bridesmaids: fishtails, French braids, and wrapped braids. A simple, discreet braid coiled on the head or across the crown is a more unique look that still has a distinctly formal and romantic touch. Medium length layers can be worn loose and beautiful for a wedding. This is a great look for a more casual celebration, and it can easily be dressed up with a jeweled clip or barrette for a touch of formality. Intricate updo hairstyles are always popular for bridesmaids. 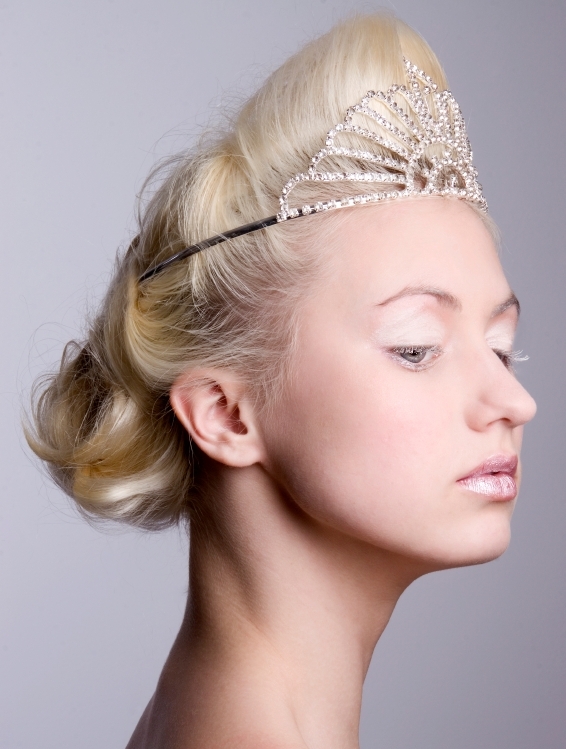 Keeping a puff of hair at the front of the head adds volume to the crown, while the curls are pinned up in the back. Loose tendrils at the back a reminiscent of the bride’s veil and add coordination between the bride’s and bridesmaids’ hairstyles. A floral wreath is not just for the flower girl. A hand woven wreath of flowers that coordinates with the bouquets can be perfect for bridesmaids in an outdoor garden wedding, a Renaissance-themed wedding, or a rustic country wedding. The wreath is best worn with straight, loose hair to keep that innocent touch, and adding some sun-kissed highlights to the look can keep it vibrant. A half updo is a romantic hairstyle perfect for a wedding. Either the bride or bridesmaids can wear this look easily by pulling back wings of hair on each side of the head and pinning them up with a jeweled clip or hairpins. Leaving longer tendrils framing the face softens the look as well, and a light bang can draw attention to the eyes. The bride isn’t necessarily the only person to wear a veil at the wedding. While her veil will be longer and more elaborate, small hair accessories with miniature veils or vintage nets can be a quaint southern belle style for the bridesmaids. This look works best with short hair pulled into a minimal updo an fastened with several coordinating hair pins. While the bride’s hair will be the most elaborate style, many bridesmaids hairstyles also include jeweled or floral hairpins, barrettes, clips, and head bands. These accessories add a touch of color and elegance to the style and can coordinate with the bride’s more elaborate look. The younger attendants in the wedding, including junior bridesmaids and flower girls, can also have special hairstyles for a special day. It is important, however, to keep young girls looking like young girls: ponytails, pigtails, or very simple styles are best for the youngest attendants. Adding a jeweled hair accessory or a coordinating flower can make these styles wedding-worthy. The classic French twist is a popular bridesmaid style, and it can be twisted in several different ways to add a unique touch. Twist the hair higher to simulate a more formal updo, and consider leaving a few tendrils to frame the face and soften the look. If you prefer a more casual look, opt for a lower twist. A simple low bun can be a great wedding look for bridesmaids. Twist the hair to the back of the head and wrap it into a firm bun, using a discreet cover or clasps to keep it in place. Clasps, wraps, and pins that coordinate with the bridesmaids’ hair colors can work well to preserve the look without adding too much glamour that might overshadow the bride’s hair. Even a simple bridesmaid style can look more elegant with well chosen hair color. Coordinated hair highlights and lowlights will richen the color for a beautiful look, or daring brides and bridesmaids might opt for streaks or peek-a-boo highlights in funky colors to match the bridal party dresses. The key to fabulous bridesmaid hairstyles is to have healthy, strong hair. Even the simplest everyday style can look lovely for a wedding if the hair is well conditioned, recently trimmed, and properly cared for.